Small - $39.99 Medium - $39.99 Large - $39.99 Only 9 left! All right, Stormtroopers. It’s another Star Wars movie, so you guys get another shot at it. No more missing critical plot characters that are standing in front of you. No more letting the droids get away. No more bumping your head on blast doors. No more getting beaten by tiny little Ewoks on some backwater forest moon. No more getting fooled by old Jedi Knights who wave their hands at you. Why even your kid probably has more skill and determination than a few of those lazy Stormtroopers we see in the movies. Your child is probably athletic enough to hop through the forest of Starkiller Base and he’s probably even a better shot than some of the other First Order members. Well, maybe it’s just time that your child showed those incompetent Stormtroopers how it’s done! 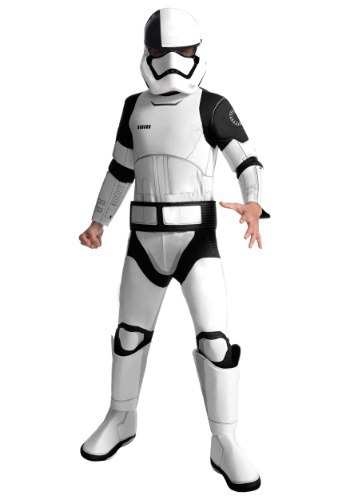 That’s right; your child has the option to join the illustrious First Order when he wears this deluxe Stormtrooper Costume from The Last Jedi. It comes with a full jumpsuit that has printed armor pieces on the front and back to help your child look ready for combat. The costume also includes a mask! Your child will be whipping those other sad troopers into shape in no time. Make sure to check out our array of Stormtrooper costume accessories to fully outfit your new little trooper. You never know when one of those plot characters will barge onto the scene and your child will need every trick he can get to make sure he doesn’t fail his duties.